West-Himalayan Asparagus is an erect, tall, shrub or subshrub, with young branches ash grey to white, branchlets grooved. Spines are about 8-12 mm long, woody. Cladodes many, frequently in fascicles of 5-20, thread-like, round, ascending or erect or recurved, 1.0-2.5 cm long. Flowers are borne in 4-6 cm long raceme. Flower-stalks are up to 6 mm long, joimted below or in the middle. Flowers are bisexual. Tepals are 3 x 2 mm, blunt. Filaments are up to 2 mm, attached to the base of perianth. Ovary is 2 x 1 mm, narrow towards the base, style upto 0.6 mm, stigma trilobed, lobes up to 1 mm. Berries are dark red, 4-5 mm in diameter. Flowering: October-November. 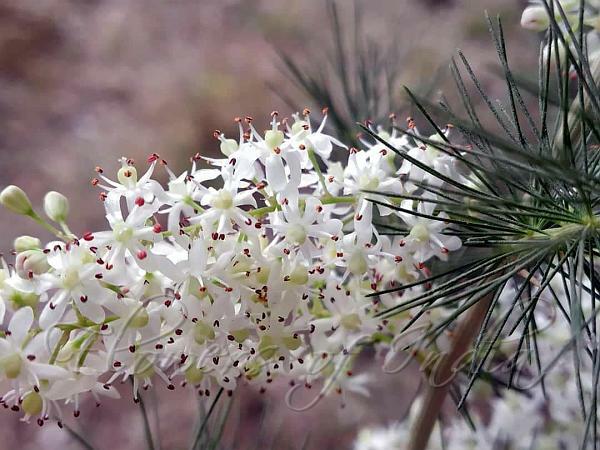 Medicinal uses: The tuber root and rhizomes of West-Himalayan Asparagus are beneficial in the treatment of infections. 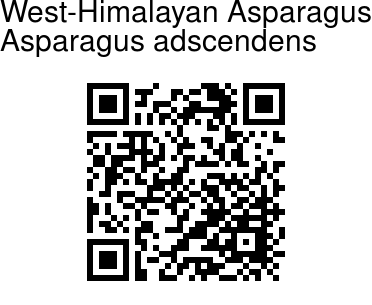 Recently, West-Himalayan Asparagus has become revered as an aphrodisiac, which has increased its popularity and cultivation in a number of regions around the world. The plant has also been used in Ayurveda as an immunity booster and as a general health tonic. Identification credit: Anil Thakur Photographed in Solan, Himachal Pradesh.